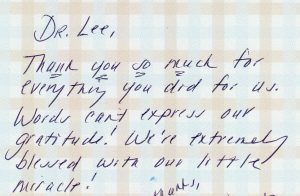 Dr. Lee was knowledgeable, understanding and made me feel like she truly cared about our success. 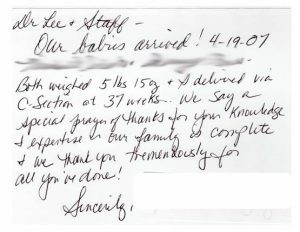 It was frustrating and trying at times visiting the office multiple times a week, trying different meds and following certain directions, but it just meant she was paying attention and doing exactly what was needed to have our little miracle. 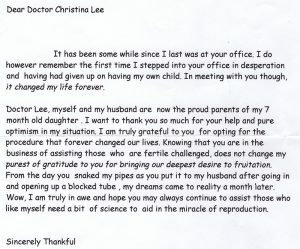 It takes time and dedication on both sides and Dr. Lee showed her dedication right until the end when we conceived! Can’t thank her and the staff enough for what they’ve done. I don’t think they truly understand what a blessing they have been throughout the whole process. 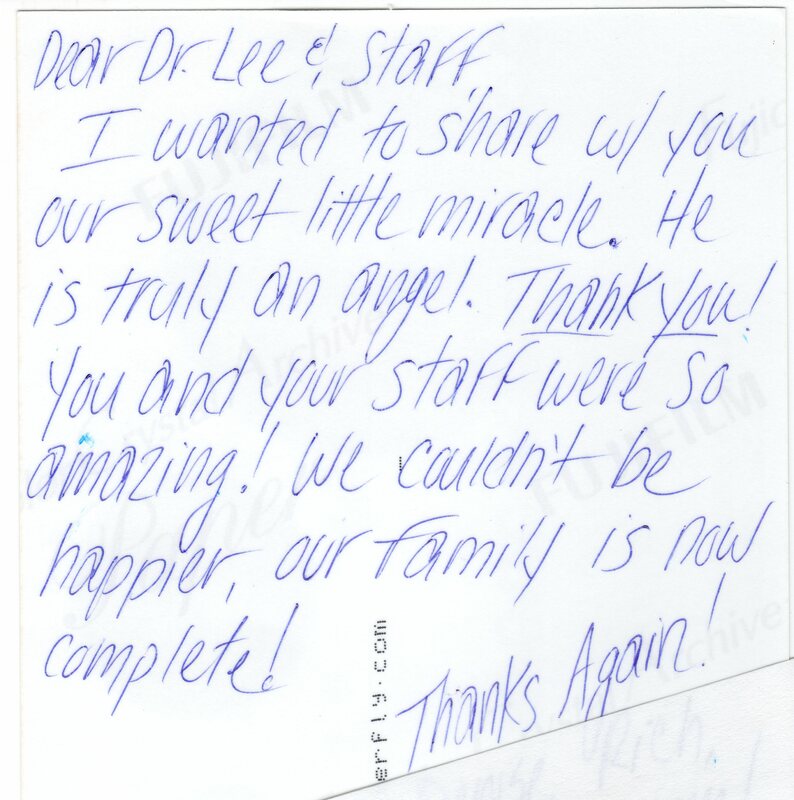 Dr. Lee and her staff are amazing!! 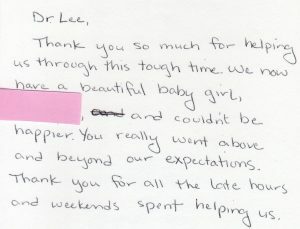 My husband and I struggled to get pregnant and with dr.Lee help we now will be proud parents.. She is honest and really cares about her patients throughout this process. I would highly recommend her!!! It’s always a pleasure whenever I go to Dr. Lee’s office, her and her staff make you feel like you’re right at home. 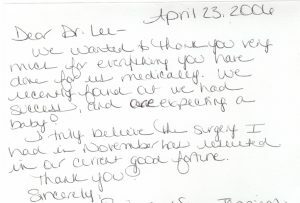 Dr Lee is very honest and will tell you the facts rather than just telling you what you want to hear. I am grateful for her expertise, and im blessed to be able to cross paths with her and her kind, welcoming and friendly team. I’m really going to miss my weekly appointments. 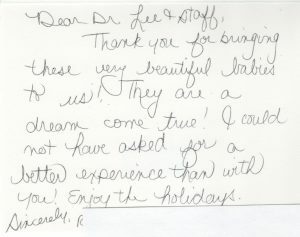 So if you’re looking for a place like home, I highly recommend Dr Lee and her team!!!! 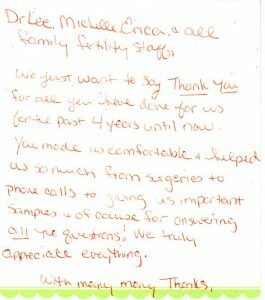 I was thrilled with my experience at the Family Fertility Center with Dr. Lee and her staff. She is honest and a true experienced, knowledgeable medical professional. 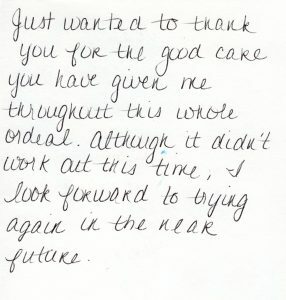 The care I recieved was at the highest level and in rapid response to my medical needs. I would not go anywhere else! 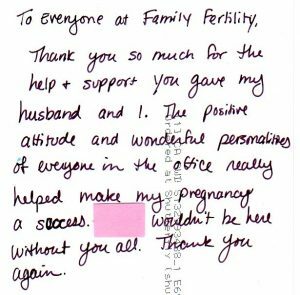 What makes us passionate about the innovative work we do in infertility treatments is not just the successes our patients have. 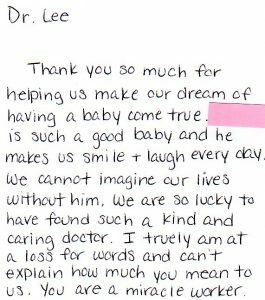 It’s also about the appreciation our patients have when they are able to have the family of their dreams. 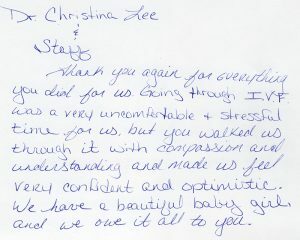 It’s our patients who keep us motivated to do our best as a family fertility clinic. 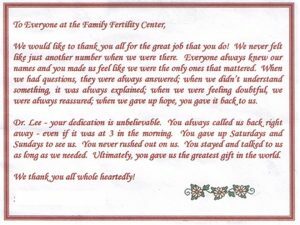 Hear the experiences of our patients to see why Family Fertility Center is the place where dreams come true. Our patients come from across Pennsylvania, New Jersey, and New York. 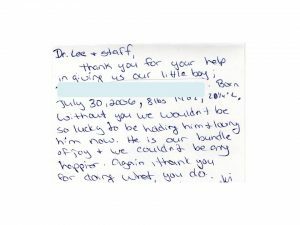 Dr Lee and her staff are all amazing. They are kind, understanding and wonderful at what they do. Each person there shares in the joy and sorrows and work hard to help you reach the goal of conceiving. I cannot be happier with them and though I wish nobody needed them I would never hesitate to send someone who is trying to conceive there. 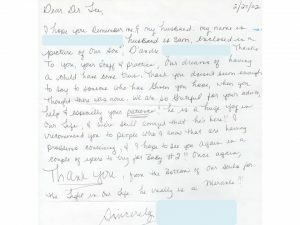 My experience with Dr. Lee is beyond positive. I miss her already. She has a warm and caring personality and a great sense of humor to boot. She’s highly knowledgeable in her field, answers any questions you may have (no matter how silly/repetitive/intimate), and makes sure you understand the process step by step. The staff is wonderful and very helpful with scheduling, form completion, and they do their best to accommodate their patients. Erica, the MA, made the blood draws a breeze, and was quite informative when it came to explaining the various medication injections/teaching how to administer the shots. I miss her as well, she’s a sweetheart. My husband and I went to Dr. Lee and after trying for 10 years we finally got our miracle baby! He will be 5 in February and since we have had 3 more boys. She made our biggest dream come true! 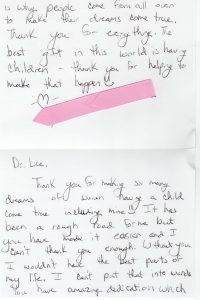 Dr Lee and her staff are amazing! 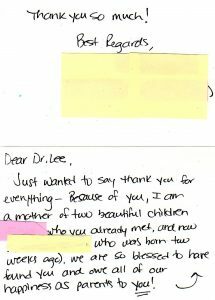 Dr Lee is very educated caring doctor who works 7 days a week to be able to get her patients in and treat them at the exact hour they need to be seen/ treated. I couldn’t be happier I’m almost 30weeks pregnant and I have her to thank for this little miracle growing inside me. The Family Fertility Center staff are very knowledgeable, helpful and understanding. I appreciated the truthfulness in the answers and their patience whenever I had a question. I couldn’t be any happier for listening to Dr. Lee’s advices and I definitely recommend Family Fertility Center to anyone seeking a good doctor to help them achieve the dream of becoming a parent. 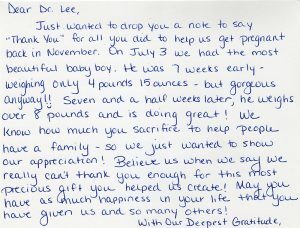 Dr. Lee and her staff at the Family Fertility Center are amazing. They welcomed us into the practice and made an emotional, difficult situation, easier. 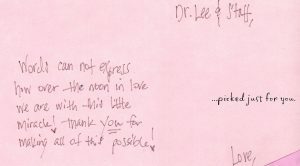 Dr. Lee spent the time to explain our situation, in terms my husband and I could both easily understand, as well as our options. 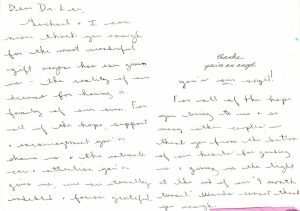 Unlike other providers we saw, she gave us hope, but still with a realistic nature. And, she gave us options. 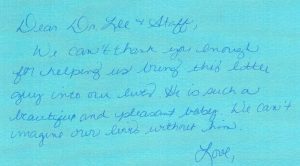 She helped us conceive our child in a manner both comfortable for us and in ways the other provider in the area wrote off and deemed impossible. Her attention to detail and commitment to her practice, is unmatched. Weekends, holidays, evenings, she is there. She steps up to do it all. That commitment is trickled down through her staff. Michelle, the office coordinator, sat down and took the time to explain our benefit coverage. She showed us the best way to maximize our insurance and how to use it for our best interest. The staff was always able to accomodate an appointment time that was best for us, including last minute changes that I needed. You feel their genuine care by just the simple things when you walk in the door, like being greeted by your first name, before you even check in. You are more than just a number to them at this practice. 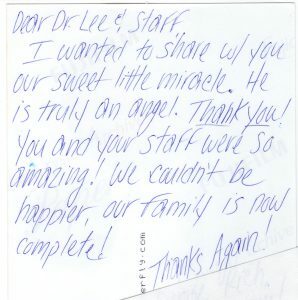 We loved our experience with Dr. Lee and the Family Fertility Center. And thanks to her commitment and efforts, we will be welcoming our new baby this fall into our family! and whoever I spoke to, I knew I would always be reassured everything would be OK. 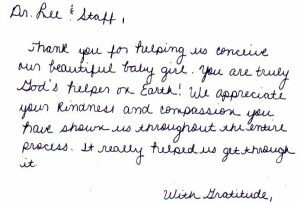 Words cannot express how thankful we are for the care and compassion we received from the very beginning. Entering the world of IVF is beyond terrifying, expensive, and worst of all, unknown. We were treated with respect and explained every little detail possible. We were never given false hope but rather positivity and encouragement to keep trying. I would never wish our journey on anyone, BUT if you are faced with fertility issues, Family Fertility Center is the place to be. Although you were an hour and a half from our house, you were always accommodating and understanding. I can honestly say I looked forward to every appointment because I knew that it meant we were one step closer. When our transfers initially failed, it was devastating but I also knew you weren’t giving up, so we couldn’t either. I am so very thankful we didn’t because we have two of the most precious miracles with us today because of your knowledge and skills. We consider you all a very important part of lives that we will never forget. We can’t wait to bring the girls down to see and meet all of you! We want to wish you a very Merry Christmas and a Happy New Year! We also want to thank you for being supportive and caring during this journey. As difficult as it’s been. All of you give us both such comfort. 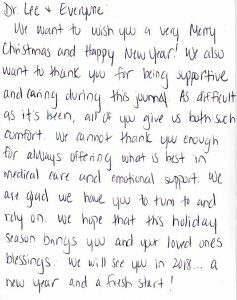 We cannot thank you enough for always offering what is best in medical care and emotional support. We are glad we have you to turn to and rely on. We hope that this holiday season brings you and your loved ones blessings. We will see you in 2018… A new year and a fresh start! I have been so blessed to have such a caring and dedicated group of people supporting us during our long journey to start a family. Thank you so much for all you do. 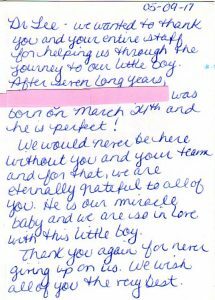 We wanted to thank you and your entire staff for helping us through the journey to our little boy. After seven long years, our baby was born on March 24th and he is perfect! We would never be here without you and your team and for that, we are eternally grateful to all of you. He is our miracle baby and we are so in love with this little boy. Thank you again for never giving up on us. We wish all of you the very best. Where to begin?! We cannot thank you enough for giving us our Miracle baby. She turned 3 weeks old recently and we still cannot believe we are parents. It has been a long journey for us and we will forever be grateful to you for your calm demeanor, willingness to explain everything to us, your patience, your professionalism, and your positive attitude. You have truly made our dreams come true and you’ve made us a family. We look forward to working with you again in the future. Words can not express how over the moon is love we are with this little Miracle! No words can describe the lifetime gift you made possible for us. It is clear to us now that God send his helpers down to earth. 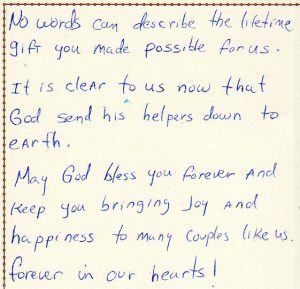 May God bless you forever and keep you bringing joy and happiness to many couples like us. We are so thankful to you for helping us and blessed to have our healthy daughter. She arrived 2/2/17. Our Baby Daughter joined us on October, 17th, 2016 weighing 6lbs 9oz. She has been a joy in every way ever since! She has recently started rolling over and it seems like she is trying very hard to crawl as well. She has found her voice, and spends a lot of time squealing, screeching and laughing! Our dogs love her and she is greatly amused by them. There are truly no words to express our gratitude for everything you have all done for us. 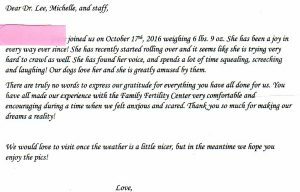 You have all made our experience with Family Fertility Center very comfortable an encouraging during a time when we felt anxious and scared. Thank you so much for making our dreams a reality! 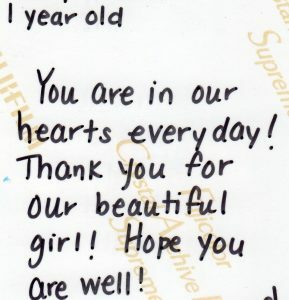 Thank you for helping us conceive our beautiful baby girl. My Husband and I can never thank you enough for the most wonderful gift anyone has ever given us – the reality of our dreams for having a family of our own. For all of the hope, support and encouragement you’ve shown us and the intimate care and attention you’ve given us, we are eternally indebted – forever grateful You’re our Angel! For all of the hope you bring to us and so many other couples, we thank you from the bottom of our hearts for guiding us and giving us the light at the end of our “9 month tunnel.” Words cannot thank you enough. We are excited to let you know that our beautiful miracle baby boy, was born on February 6th. He weighed 8.5lbs and measured 19.5 inches long. We waited so long to finally become parents – we can’t thank you enough for helping our dream become a reality!! 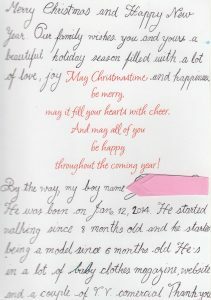 Our baby is doing wonderful – he is a healthy and very happy little boy we are cherishing every single minute with him. Sometimes it’s still hard to believe he’s really here. From the bottom of our hearts, thank you for making our family complete! 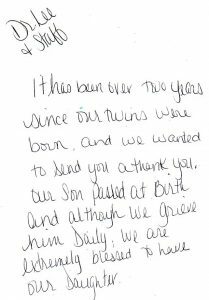 It has been over two years since our twins were born, and we wanted to send you a thank you. Our son passed at birth and although we grieve him daily, we are extremely blessed to have our daughter. 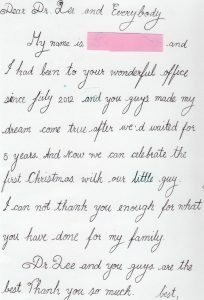 Our children were just a dream before coming to your office. 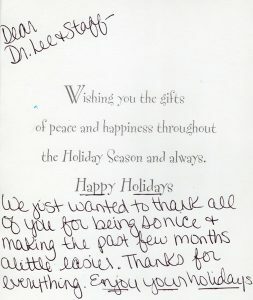 We appreciate your kindness, your staff’s professionalism as well as the support given. Attached is a photo of our daughter with a bear for our Son that you made possible. Thanks for all your support and helping us achieve this! We are having a girl! Just wanted to say thank you for everything – Because of you, I am a mother of two beautiful children (Son who you already met, and now Daughter who was born two weeks ago). We are so blessed to have found you and owe all of our happiness as parents to you! Words cannot express how thankful we are for everything you and your staff did for us. We finally have our long awaited dream of adding to our family, We are over excited to welcome our new baby girl in February. Much Gratitude. Our sweet little girl was born in August! Thank you so much for helping make our dreams come true! Our sweet little girl was born in August! 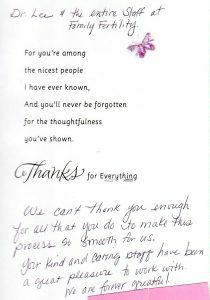 We wanted to show you how much we appreciated your help! So – CHEERS TO YOU! Enjoy! Our little miracle would not have been possible without you. There are no words that can ever express how thankful we are to you in helping us begin our family. 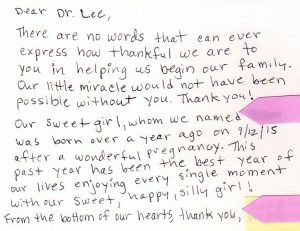 Our little miracle would not have been possible without you. Thank you! Our sweet girl, whom we named _____, was born over a year ago after a wonderful pregnancy. This past year has been the best year of our lives enjoying every single moment with our Sweet, happy, silly girl! From the bottom of our hearts, thank you! We are incredibly grateful for all your expertise, knowledge and care for our beautiful new babies! I will never forget my experience with your office and how I came to trust and rely on you and your staff. I will forever be thankful for the now, family of 5, that we have! You are amazing at what you do and how dedicated you are at your practice! It’s truly unbelievable how you do it! We wish you the best! Lots of Love! We couldn’t have asked for a better Christmas present… he is perfect! 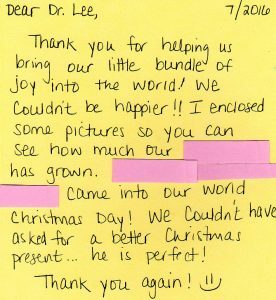 Thank you for helping us bring our little bundle of joy into the world! We couldn’t be happier!! I enclosed some pictures so you can see how much our baby has grown. Baby came into our world Christmas Day! We couldn’t have asked for a better Christmas present… he is perfect! We can’t thank you enough for all that you do to make this process so smooth for us. Your kind and caring staff have been a great pleasure to work with. We are forever greteful! Thank you for all you’ve done for my family. You’ve made such a difference in our life. Thank you from the bottom of our hearts for making our dream of becoming parents, a reality. 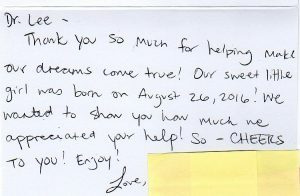 Thank you so much for helping us make our dream of having a baby come true. 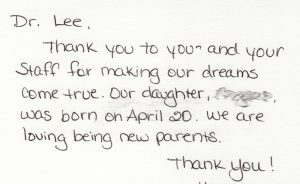 Thank you so much for helping us make our dream of having a baby come true. Baby is such a good baby and he makes us smile + laugh every day. We cannot imagine our lives without him. 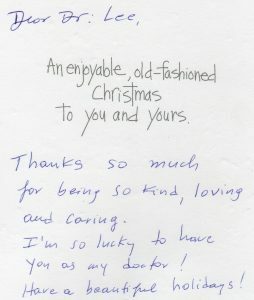 We are so lucky to have found such a kind and caring doctor. I truly am at a loss for words and can’t explain how much you mean to us. You are a miracle worker. Two miracles instead of one! Thank you and your staff so much! You were all so nice and we will never forget the help you gave us! Two miracles instead of one! We couldn’t thank you enough. Thank you so much for the help + support you gave my husband and I. 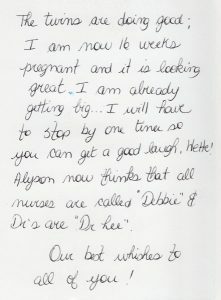 The positive attitude and wonderful personalities of everyone in the office really helped make my pregnancy a success. Baby wouldn’t be here without you all. Thank you again. You would always joke with us that you are not God — while that is true, we wouldn’t be where we are today without you. 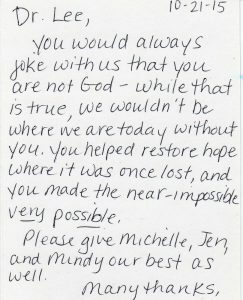 You helped restore hope where it was lost, and you made the near-impossible very possible. Please give Michelle, Jenn, and Mindy our best as well. 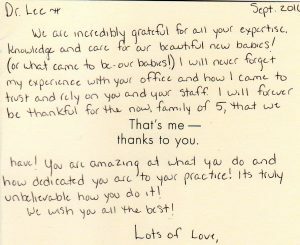 Words cannot express our immense gratitude to the incredible team at the Family Fertility Center. 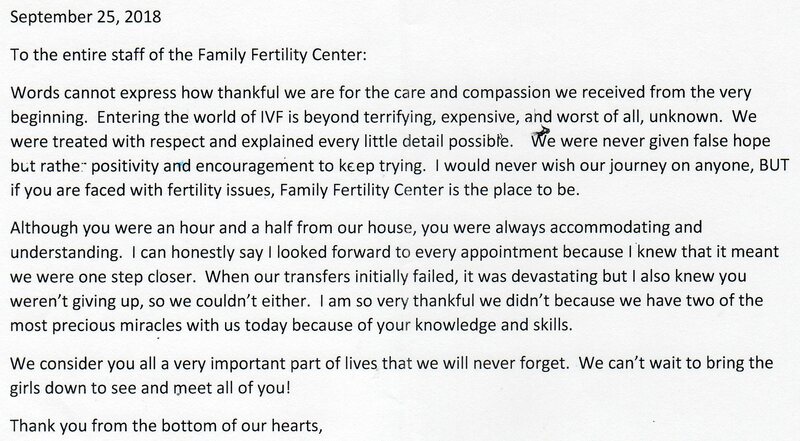 Words cannot express our immense gratitude to the incredible team at the Family Fertility Center. You have helped fill our heats with joy and anticipation for our new addition. You all provided hope when we felt despair and we are forever grateful for the level of compassion and care you provided. 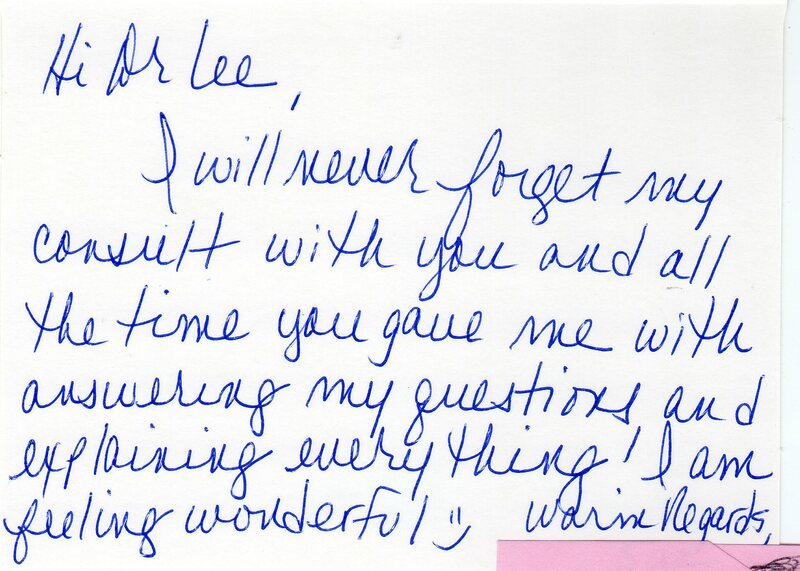 Each of you have a special gift for teaching your patients as individuals and giving us your undivided sensitivity. You all have a very special place in our hearts. It’s not goodbye – just see you later. We are so thankful for the impact you have had on our lives. We are so thankful for the impact you have had on our lives. 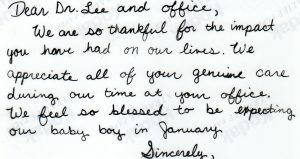 We appreciate all of your genuine care during our time at your office. We feel so blessed to be expecting our baby in January. 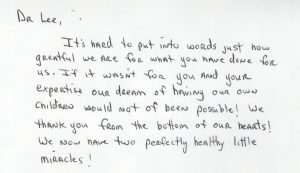 I hope this note finds you well. I was a patient around 11 years ago and gave birth to my son (Name) meaning happiness on 4/21/04, when I was then living in Allentown. There are no sufficient words to express my ongoing gratitude and Sincere appreciation for your skill and compassion. Thank you so much for helping us through this tough time. Thank you so much for helping us through this tough time. We now have a beautiful baby girl, and couldn’t be happier. You really went above and beyond our our expectations. Thank you for all the late hours and weekends spent helping us. Thank you for making so many dreams of woman having a child come true incredibly mine! Thank you for making so many dreams of woman having a child come true incredibly mine! It has been a rough road for me but you have made it easier and I can’t thank you enough. Without you I wouldn’t have the best parts of my life. I can’t put this into words you have amazing dedication which is why people come from all over to make their dreams come true. Thank you for everything. 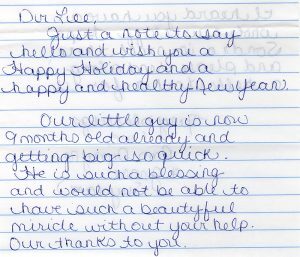 The best gift in this world is having Children – thank you for helping to make that happen. Thank you so much for our greatest blessing! Thank you so much for our greatest blessing! She is amazing and we love her so much! Miss you and hope you are well! Thank you so much for all of the kindness and professionalism of you and your staff. Thank you so much for all of the kindness and professionalism of you and your staff. We appreciate your knowledge, humor, and positive attitude. 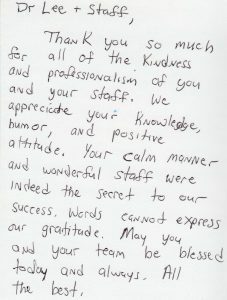 Your calm manner and wonderful staff were indeed the secret to our success. Words cannot express our gratitude. May you and your team be blessed today and always. All the best. Words can’t express our gratitude! Thank you so much for everything you did for us. Words can’t express our gratitude! We’er extremely blessed with our little miracle! Many Thanks. We hope you are well! Just wanted to wish you a Happy Holiday! We hope you are well! Just wanted to wish you a Happy Holiday! Here is a picture of our son! Thank you again for making it possible for us to have our sweet baby. I’m so lucky to have you as my doctor! Thanks so much for being so kind, loving and caring. I’m so lucky to have you as my doctor! We can’t thank you enough for helping us bring this little guy into our lives. He is such a beautiful and pleasant baby. We can’t thank you enough for helping us bring this little guy into our lives. He is such a beautiful and pleasant baby. We can’t imagine our lives without him. You are in our hearts every day! Thank you for our beautiful girl. Hope you are well. Thank you very much for helping us fulfill our dreams. God Bless. My name is —- and I had been to your wonderful office since July 2012 and you guys made my dream come true after we’d waited for 5 years. And now we can celebrate the first Christmas with our little guy. I can not thank you enough for what you have done for my family. This wouldn’t have been possible without you. 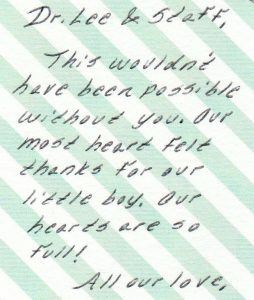 Our most heart felt thanks for our little boy. Our hearts are so full! Thank you so much for our beautiful family. You are forever in our hearts. Love Always. Thanks to each of you… thanks to all of you… thanks for everything! Thank you all so much for all you’ve done throughout our journey to start a family. Most of all, thank you for being so good to my wife each step of the way. We are grateful for each of you. A year ago I never thought we would be here, a little more than half through a nearly perfect pregnancy. We had all of you to thank for that. We are still baffled by what you can do, how well you do it, and most importantly, how thoughtful you are each step of the way. The kindness you give each partner is a gift and a relief through a long & stressful process. You always gave us the feeling as though we were your # 1 priority during the entire process ~ Such a great feeling when everything else is so unsure. We do not know how it is that you are able to do the amazing things you do with such patience & grace, but thank you for helping us become the family we could not become on our own. Your work matters more then we could ever say. Thank you endlessly for what you do. 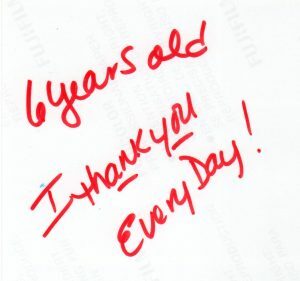 6 years old, I Thank You Every Day! I Thank You Every Day! We would like to thank you all for the great job that you do! We would like to thank you all for the great job that you do! We never felt like just another number when we were there. Everyone always knew our names and you made us feel like we were the only ones that mattered. When we had questions, they were always answered; when we didn’t understand something, it was always explained; when we were feeling doubtful, we were always reassured; when we gave up hope, you gave it back to us. 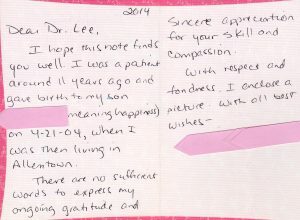 Dr. Lee – your dedication is unbelievable. You always called us back right away – even if it was at 3 in the morning. You gave up Saturdays and Sundays to see us. You never rushed out on us. You stayed and talked to us as long as we needed. Ultimately, you gave us the greatest gift in the world. We thank you all whole heartedly! Words cannot express our joy this Christmas time. I hope you remember me & my husband. I hope you remember me & my husband. Enclosed is a picture of our son. 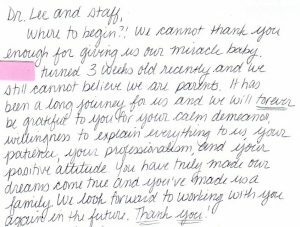 Thanks to you, your staff & practice, our dreams of having a child have come true. Thank you does not seem enough to say to someone who has given you hope, when you thought there was none. We are so grateful for your advice, help & especially your patience. He is a huge joy in our life & we are still amazed that he is here! 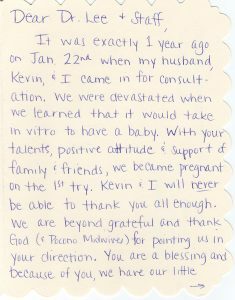 I recommended you to people who I know that are having problems conceiving, & I hope to see you again in a couple of years to try for Baby # 2 ! ! ! Once again, Thank you, from the Bottom of our souls for the light in our life. He is really a Miracle!!! 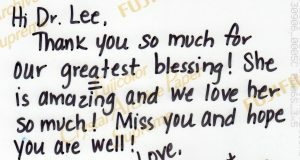 Dr. Lee Thank you for giving us life! Thank you for giving us life! We want to sincerely thank you for helping us start our family. We want to sincerely thank you for helping us start our family. We feel very fortunate to have found such a professional group so close to home. You all were really so wonderful to work with and it made the whole process so much easier to deal with and absorb along the way. Thank you again for everything you did for us. Going through I.V.F. was a very uncomfortable & stressful time for us. But you walked us through it with compassion and understanding and made us feel very confident and optimistic. We have a beautiful baby girl and we owe it all to you. Hope you have a wonderful Christmas and thank you again for everything. Hope you have a wonderful Christmas and thank you again for everything. Now we have a house full of noise and toys. What else could we ask for Christmas. Have a peaceful New Year. The twins are doing good: I am now 16 weeks pregnant and it is looking great. I am already getting big….. I will have to stop by one time so you can get a good laugh. He He Alyson now thinks all nurses are called Debbie & Dr are “Dr. 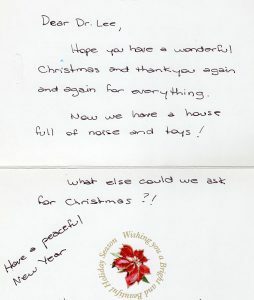 Lee” Our best wishes to all of you. A special thank you to Dr. Lee for helping making this wonderful dream of ours a reality; Emily and Jacob are now with us and Alyson is a big sister. We feel very blessed to have met you and this journey of ours; thank you for being such a wonderful person & Doctor. And what would I have done without the constant reassurance and patience of Debbie? Thanks to you for everything. 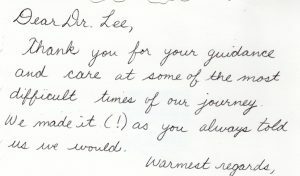 Dear Dr. Lee, Thank you for your guidance and care at some of the most difficult times of our journey. We made it! As you always told us we would. Thank you for your guidance and care at some of the most difficult times of our journey. We made it! As you always told us we would. 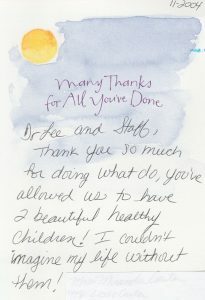 Dr. Lee and Staff, Thank you so much for doing what you do, you have allowed us to have two beautiful healthy children! I could not imagine my life without them. Thank you so much for doing what you do, you have allowed us to have two beautiful healthy children! I could not imagine my life without them. Hope all is going well with you. Since my brother & sister-in-law were coming to see you, I thought I would enclose a recent photo of the children. 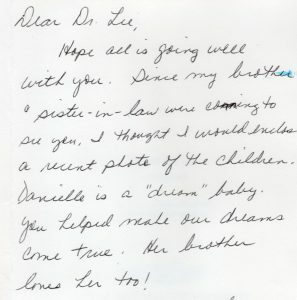 Danielle is a “dream” baby. You have helped make our dreams come true. Her brother loves her too. 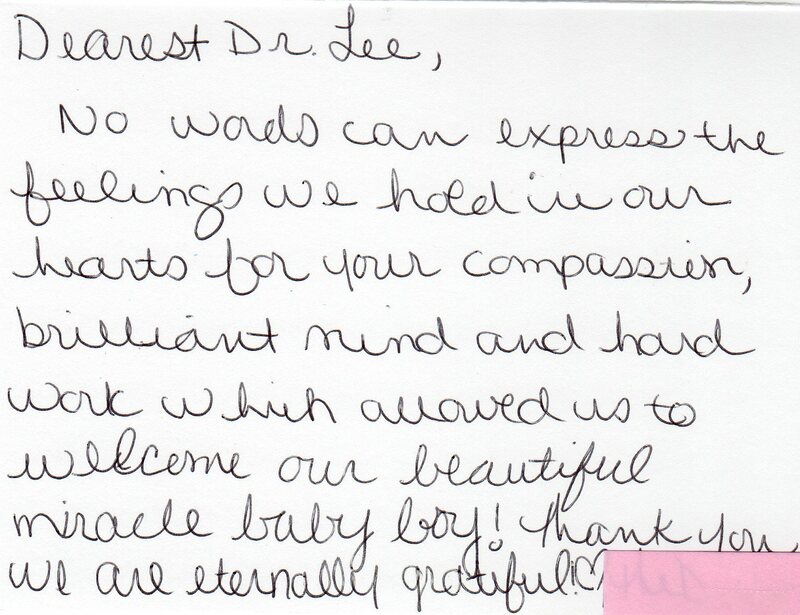 Dr. Lee & Staff Words cannot express how much you all mean to us. Not only have you helped make our number one dream come true, but you made a very difficult journey a lot easier for us. We will never forget you! Words cannot express how much you all mean to us. 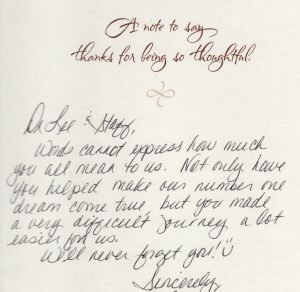 Not only have you helped make our number one dream come true, but you made a very difficult journey a lot easier for us. We will never forget you! Thank you so much for giving us the opportunity to have the most perfect and beautiful Christmas gift! Thank you! Thank You! Thank you! We really appreciate all you have done for us. 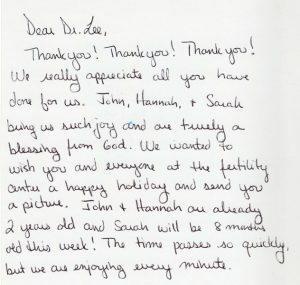 John, Hannah & Sarah bring us such joy and are truly a blessing from God. 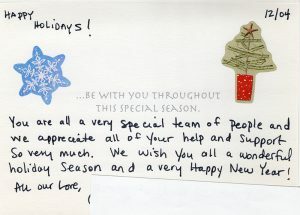 We wanted to wish you and everyone at the Fertility Center a happy holiday and send you a picture. John & Hannah are already two years old and Sarah will be 8 months old this week! The time passes so quickly, but we are enjoying every minute. 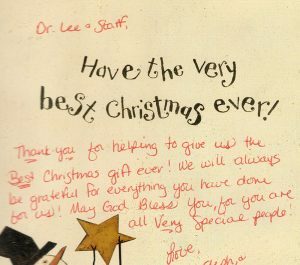 Dr. Lee This holiday greeting comes to you with many thanks. 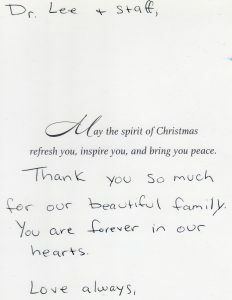 You helped us achieve such a wonderful gift of three beautiful children. We appreciate all you have done. Enjoy your holiday with family friends. God Bless! This holiday greeting comes to you with many thanks. 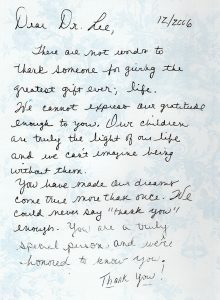 You helped us achieve such a wonderful gift of three beautiful children. We appreciate all you have done. Enjoy your holiday with family friends. God Bless! Patrick and I just want you to know that we are forever grateful for our beautiful children. 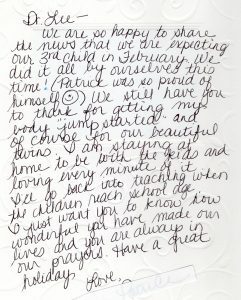 Patrick and I just want you to know that we are forever grateful for our beautiful children. We have one more on the way, due in February. Can you believe that I have to have my “tubes tied”. Four children will complete our family. I still pray for you and the women you help to become mothers. Merry Christmas! We are so happy to share the news that we are expecting our 3rd child in February. We are so happy to share the news that we are expecting our 3rd child in February. We did it all by ourselves this time. We still have you to thank for getting my body jump started. And of course for our beautiful twins. I am staying at home to be with the kids and loving every minute of it. I will go back into teaching when the children reach school age. I just want you to know how wonderful you have made our lives and you are always in our prayers. Have a Great Holiday! 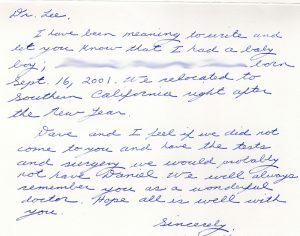 How do you even begin to thank someone who has been so instrumental to helping you achieve your ultimate wish in life? 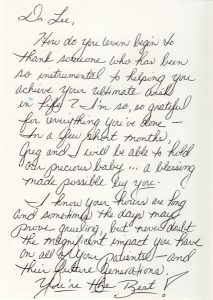 How do you even begin to thank someone who has been so instrumental to helping you achieve your ultimate wish in life? I am so grateful for everything you have done. In a few short months, Greg and I will be able to hold our precious baby…A blessing made possible by you, I know your hours are long and sometimes the days may prove grueling, but never doubt the magnificent impact you have on all of your patients — and their future generations. You are The Best. 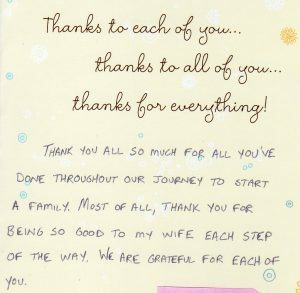 Thank you all so much for all the care and dedication you have given to us in our attempt to have another child. 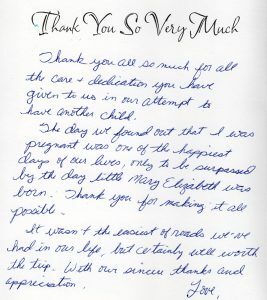 Thank you all so much for all the care and dedication you have given to us in our attempt to have another child. The day we found out that I was pregnant was the happiest days of our lives, only to be surprised by the day little Mary Elizabeth was born. Thank you for making it all possible. It was not the easiest of roads we have had in our life, but certainly well worth the trip. With our sincere thanks and appreciation. I am sure you hear “Thanks” all the time, well here is another! I am sure you hear “Thanks” all the time, well here is another! Without you we would not have our twins, and without our twins, our life means nothing. You have helped us achieve our greatest dream, TWICE, and for this we are eternally grateful. 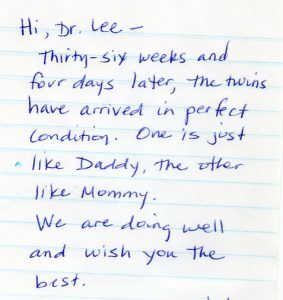 Hi, Dr. Lee Thirty-six weeks and four days later, the twins have arrived in perfect condition. One is just like Daddy, the other like Mommy. We are doing well and wish you the best. Thirty-six weeks and four days later, the twins have arrived in perfect condition. One is just like Daddy, the other like Mommy. We are doing well and wish you the best. 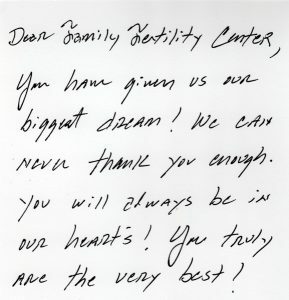 Dear Family Fertility Center, You have given us our biggest dream! We can never thank you enough. You will always be in our hearts! You truly are the very best! You have given us our biggest dream! We can never thank you enough. You will always be in our hearts! You truly are the very best! We just wanted to thank all of you for being so nice & making the past few months a little easier. Thanks for everything. Enjoy you holidays. It was exactly 1 year ago on Jan 22nd when my husband, and I came in for consultation. It was exactly 1 year ago on Jan 22nd when my husband, and I came in for consultation. We were devastated when we learned that it would take in vitro to have a baby. With your talents, positive attitude & support of family & friends, we became pregnant on the 1st try. I will never be able to thank you all enough. 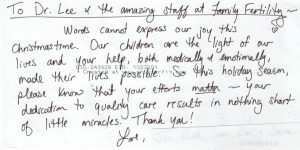 We are beyond grateful and thank God (& Pocono Midwives) for pointing us in your direction. You are a blessing and because of you, we have our little gift from God. Thank you all so much more then we could ever express. Dear Dr, Lee Thank you for bringing these very beautiful babies to us! Thank you for bringing these very beautiful babies to us! They are a dream come true! I could not have asked for a better experience than with you! Enjoy the holidays! Thank you for everything. This had been quite a journey for all of us. You & your dedication & compassion has truly made a difference for us. We appreciate everything that you have done for us. Words cannot express the gratitude that my husband and I have for all you have done for us. Words cannot express the gratitude that my husband and I have for all you have done for us. We are now the proud parents of a beautiful baby boy and girl, Our lives feel so complete! We owe it all to you. Just wanted to thank you for the good care you have given me throughout this whole ordeal. Although it did not work out this time, I look forward to trying again in the near future! Without all of you, I would not have been blessed with my sweet little baby boy. Without all of you, I would not have been blessed with my sweet little baby boy. Thank you for everything. We hope to be back when Timmy Jr. is ready for a sibling. Dr. Lee & Deb We are pleased to announce the birth of our son Luca Daniel. We are fortunate to be blessed as parents. Thank you for helping make our dream come true. We are pleased to announce the birth of our son Luca Daniel. We are fortunate to be blessed as parents. Thank you for helping make our dream come true. 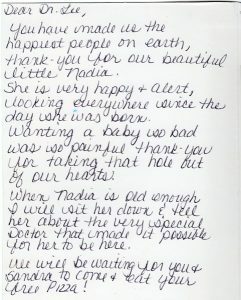 You have made us the happiest people on earth, thank – you for our beautiful little Nadia. You have made us the happiest people on earth, thank – you for our beautiful little Nadia. She is very happy & alert, looking everywhere since the day she was born. Wanting a baby so bad was so painful thank you for taking that hole out of our hearts. When Nadia is old enough I will sit her down & tell her about the very special doctor that made it possible for her to be here. It is hard to put into words just how grateful we are for what you have done for us. It is hard to put into words just how grateful we are for what you have done for us. If it was not for you and your expertise our dream of having our own children would not be possible! We thank you from the bottom of our hearts! We now have two perfectly healthy little miracles! Well, here is a picture of our little miracle! Well, here is a picture of our little miracle! He is about 4 months old in the picture and still growing like a weed. Thanks again for all of your getting him here. Everything is going well with the pregnancy and on Valentines Day I will be 6 months along. Hello to everyone at Family Fertility! I think of you often and hope you are doing well. Everything is going well with the pregnancy and on Valentines Day I will be 6 months along. Our 20 week ultrasound at the hospital showed us that our baby is healthy and that we are having a girl! We are both so exicited. It is impossible to thank you enough for all you have done for us and all your caring. Thank you for giving us this miracle. 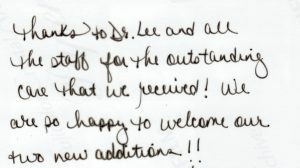 Thanks to Dr. Lee and all the staff for the outstanding care that we received! We are so happy to welcome our two new additions!! 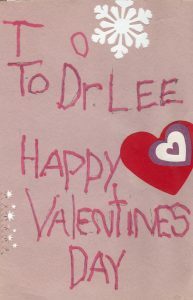 Thank you so very much Dr. Lee You have always been there whenever I needed, at all odd hours and even weekends. You have always been there whenever I needed, at all odd hours and even weekends. Thank you all very much for the Priceless Gift that Brings Light, Joy and Happiness to our lives, which would not have been possible without your help and support. My husband and I just wanted to thank you for all you did to bring our baby into the world. You may not remember us. We only met with you once for a consultation and I learned a few days later that I was pregnant. In those early weeks, I had some spotting and you placed me on bedrest. You also monitored my pregnancy in early weeks through use of ultrasound. Having had a previous miscarriage. It was such a relief to see the pregnancy progressing in a positive direction. As you can see from the picture, we are now the proud parents of a beautiful baby boy. 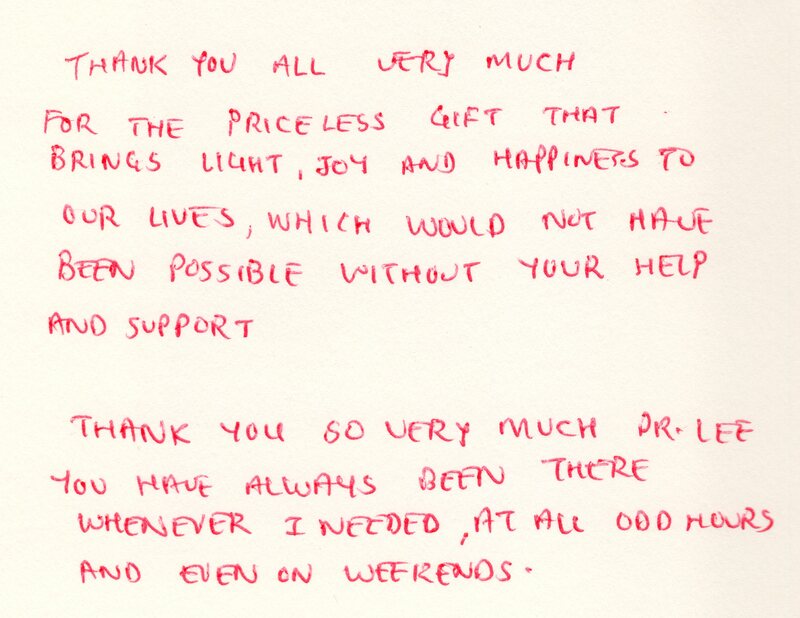 We feel very blessed and fortunate to have been in your care during those early weeks. Thank you so much. 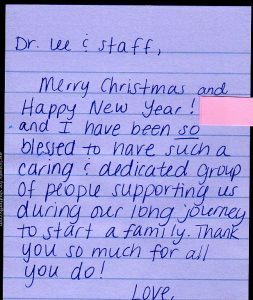 Dr. Lee & staff Thank you for helping to give us the best Christmas gift ever! We will always be grateful for everything you have done for us! May God Bless you, for you are all Very Special People! Thank you for helping to give us the best Christmas gift ever! We will always be grateful for everything you have done for us! May God Bless you, for you are all Very Special People! I wanted to share with you our sweet little miracle. I wanted to share with you our sweet little miracle. He is truly an angel! Thank You! You and your staff were so amazing! We cannot be happier, our family is now complete! Thank you! You are all a very special team of people and we appreciate all of your help and support so very much. We wish you all a wonderful holiday season and a very Happy New Year. All our Love Happy Holidays! I have been meaning to write and let you know that I had a baby boy born Sept 16, 2001. I have been meaning to write and let you know that I had a baby boy born Sept 16, 2001. We relocated to Southern California right after the New Year. Dave and I feel if we did not come to you and have the tests and surgery we would probably not have Daniel. We will always remember you as a wonderful doctor. Hope all is well. 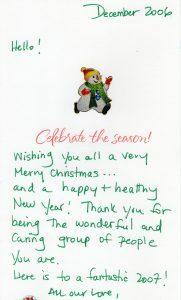 Just a note to say hello and wish you a happy and healthy New Year. Just a note to say hello and wish you a happy and healthy New Year. Our little guy is now 9 months old already and getting big so quick. He is such a blessing and would not be able to have such a beautiful miracle without your help. Our thanks to you. There are not words to thank someone for giving the greatest gift ever; Life. There are not words to thank someone for giving the greatest gift ever; Life. We cannot express our gratitude enough to you. Our children are truly the light of our life and we cant imagine being without them. You have made our dreams come true more than once. We could never say “thank you” enough. You are a very special person, and we are honored to know you. Thank you! 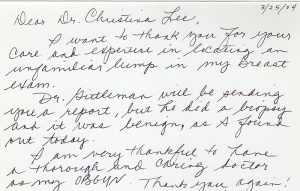 Dear Dr. Christina Lee I want to thank you for your care and expertise in locating an unfamiliar lump in my breast exam. He did a biopsy and it was benign, as I found out today. I am very thankful to have a thorough and caring doctor as my OBGYN. Thank you again! I want to thank you for your care and expertise in locating an unfamiliar lump in my breast exam. He did a biopsy and it was benign, as I found out today. I am very thankful to have a thorough and caring doctor as my OBGYN. Thank you again! 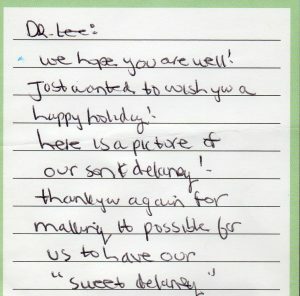 Dear Dr. Lee Thank you so much for your professional treatment and kind advice in the past months. No words can properly express my appreciation and happiness at this moment! Thank you! Thank you so much for your professional treatment and kind advice in the past months. No words can properly express my appreciation and happiness at this moment! Thank you! Thank you for our miracle. 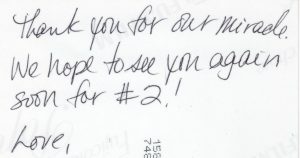 We hope to see you again soon for # 2! 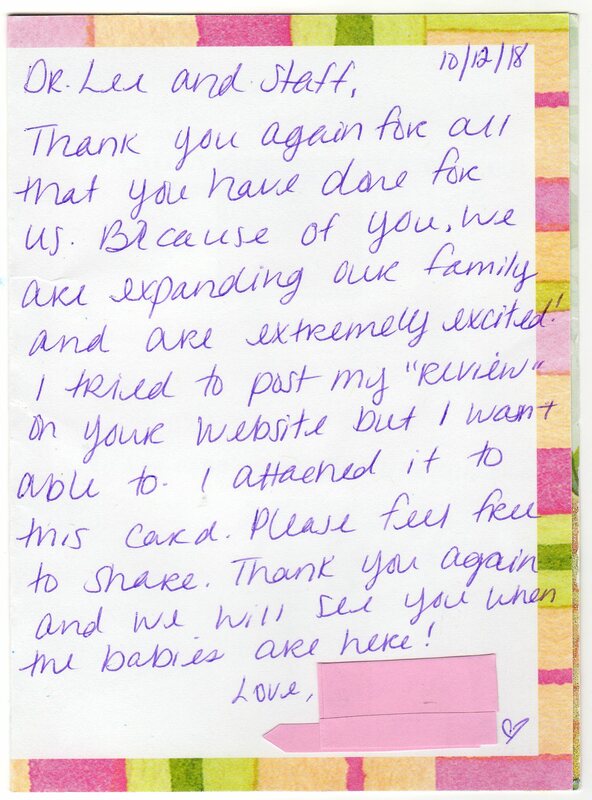 Just wanted to drop you a note to say “Thank You” for all you did to help us get pregnant back in November. 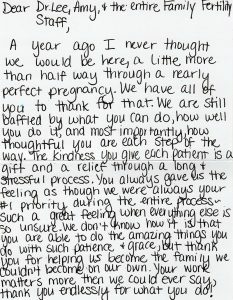 Just wanted to drop you a note to say “Thank You” for all you did to help us get pregnant back in November. On July 3 we had the most beautiful baby boy. 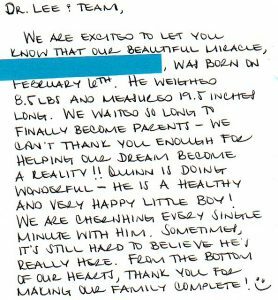 He was 7 weeks early – weighing only 4 pounds 15 ounces – but gorgous anyway!! Seven and a half weeks later, he weighs over 8 pounds and is doing great! 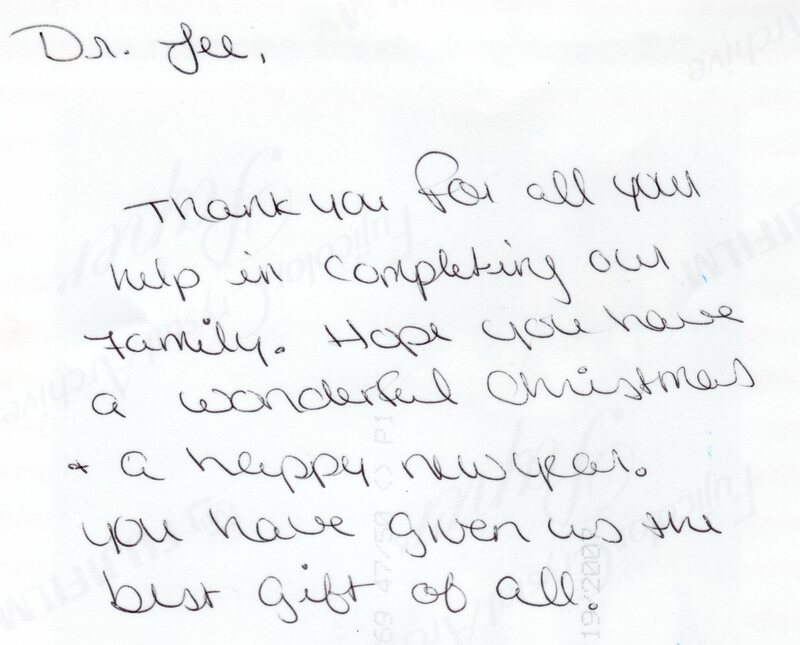 We know how much you sacrifice to help people have a family – so we just wanted to show our appreciation! Believe us when we say we really cant thank you enough for this most precious gift you helped us create! May you have as much happiness in your life that you have given us and so many others! 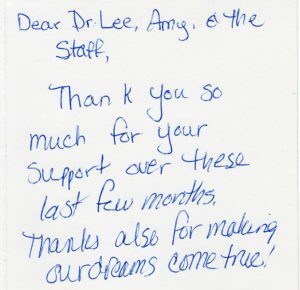 Dr. Lee & Staff Thank you for all you have done for us over the past few years. We treasure the 2 little miracles that you helped to bring into our lives! Wishing you all nothing but the best Holiday Season for the coming year! Thank you for all you have done for us over the past few years. We treasure the 2 little miracles that you helped to bring into our lives! Wishing you all nothing but the best Holiday Season for the coming year! 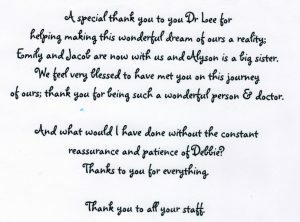 Dr. Lee Thank you to you and your staff for making our dreams come true. Our daughter was born on April 20. We are loving being new parents. Thank you! Thank you to you and your staff for making our dreams come true. Our daughter was born on April 20. We are loving being new parents. Thank you! Thank you for all your help in completing our family. Thank you for all your help in completing our family. Hope you have a wonderful Christmas & a Happy New Year. You have given us the best gift of all. It has been some while since I last was in your office. It has been some while since I last was in your office. I do however remember the first time I stepped into your office in desperation and having had given up on having my own child. In meeting with you though, it changed my life forever. Dr. Lee, myself and my husband are now the proud parents of my 7 month old daughter. I want to thank you so much for your help and pure optimism in my situation. 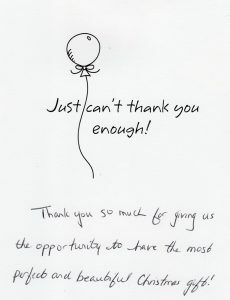 I am truly grateful to you for opting for the procedure that forever changed our lives. 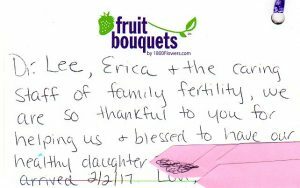 Knowing that you are in the business of helping those who are fertile challenged, does not change my purest of gratitude to you for bringing our deepest desire to fruition. From the day you ‘snaked my pipes’, as you put it to my husband after going in and opening up a blocked tube, my dreams came to a reality a month later. Wow, I am truly in awe and hope that you may always continue to assist those like myself who need a bit of science to aid in the miracle of reproduction. 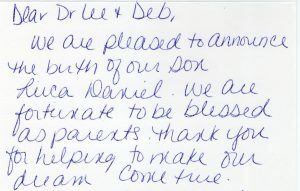 Dr. Lee & Staff Thank you for your help in giving us our little boy! Joshua, born July 30, 2006. Thank you for your help in giving us our little boy! Joshua, born July 30, 2006. Without you, we would not be so lucky to be holding him & loving him now. He is our bundle of joy & we could not be any happier. Again, thank you for doing what you do. I would like to take the time and thank you for all you have done. I would like to take the time and thank you for all you have done. 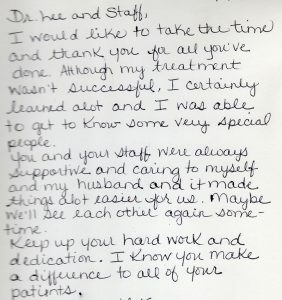 Although my treatment was not successful, I certainly learned a lot and I was able to get to know some very special people. 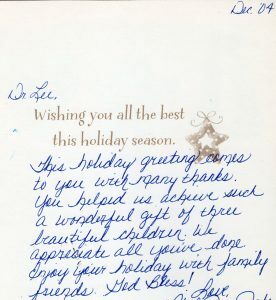 You and your staff were always supportive and caring to myself and my husband and it made things a lot easier for us. Maybe we will see each other again sometime. Keep up your hard work and dedication. 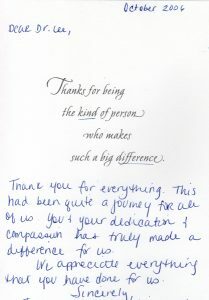 I know you make a difference to all of your patients. 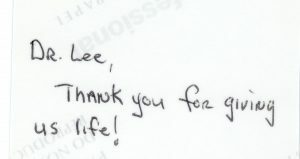 Dr. Lee, You are an amazing doctor. Thank you for your experience and knowledge in this process. 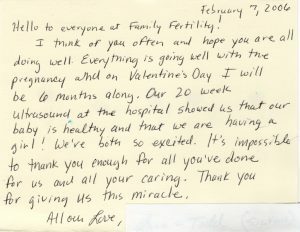 You are a real asset to the Lehigh Valley AND the IVF world. You are an amazing doctor. Thank you for your experience and knowledge in this process. 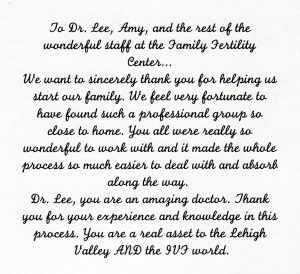 You are a real asset to the Lehigh Valley AND the IVF world. Thank you so much for giving us the help we needed. 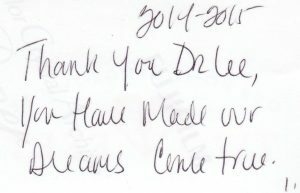 Thank you Dr Lee, You have our Dreams Come True. You have our Dreams Come True.